While I almost always wear tunic and tank style tops with my leggings, this blouse is refreshing change when you want a classic dressy casual look. It’s an ideal top choice to add to the 10th Doctor vibe when worn with the tie since he wore a white collared shirt. I’ve had this vest in my closet for years and almost never wear it. I was inspired to pair it with the Police Box leggings as it was the closest thing in my closet that gave off a 11th Doctor coat vibe, and in the end I just liked how it looked with the outfit with or without the tie on. I’m pretty sure every female Doctor Who fan’s heart (both of them!) 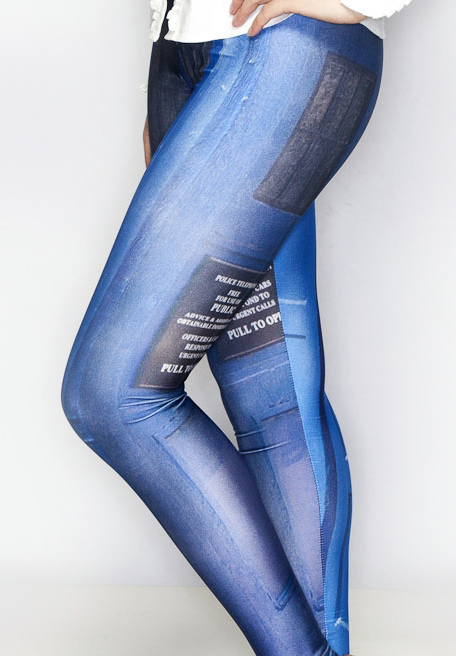 skipped a beat when Black Milk released a print tantalizing called “Police Box“. Offered as both a dress and a pair of leggings, I’m sure many of you, like me, bought both! This print is great because, while bold and vivid in color and design, it’s also a bit on the subtle side in terms of screaming “GEEK”. You’d need to be at least a little familiar with the series to know what you’re looking at. As with most of my looks, if the leggings are loud, I keep the rest of the ensemble simple to avoid overloading the look. I’ve worn these shoes before, with my Captain America and Ewok looks. Brown is a great color to have in your shoe collection, especially for geek-themed clothing. I never thought I would get this much use out of a pair of brown sandals! You can find great shoes at places like DSW and Target, just keep an eye on their discounted and clearance selections to really come away with a great deal on some fabulous footwear. Indy Magnoli produces a vast array of movie replica clothing. A well-known piece from them is their replica of the tie the 10th Doctor wore in episodes like “The Girl in the Fireplace”. It’s a beautiful design, recognizable by many a fan. While obviously a truly “male” accessory, I love ties because they are a fun and unique accessory to incorporate into a female wardrobe. Pairing this tie with the Police Box leggings is a very simple, yet sharp and automatically recognized way to show your love of Doctor Who. The fantastic line of Doctor Who jewelry that was released by Harlequin Goldsmiths came out after I put this look together and did these photos. 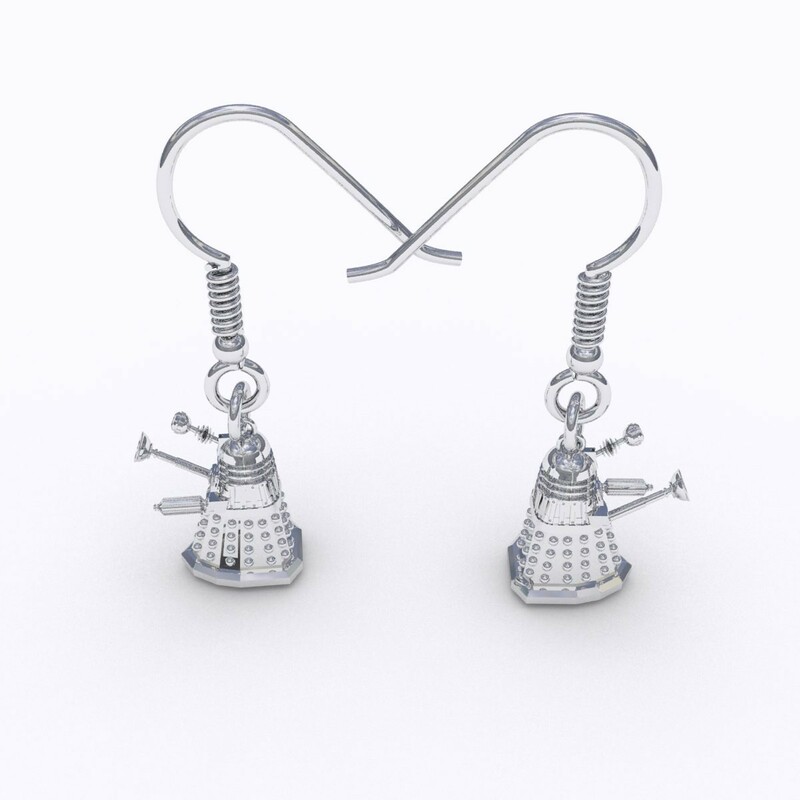 I think a great final touch to this look would be to add a pair of their Dalek earrings! As always, feel free to give us feedback on our Looks, or share your outfits or styling tips with us on Facebook and Twitter. We generally just recommend shoe colors, types, and where to buy shoes as the footwear we’re often using in our examples are shoes we’ve owned for ages and are no longer available. My shoes are from Ann Loft from about 5+ years ago. I don’t know if it had a style name, but that type of shoe is sometimes referred to as a T-strap.